NETWORK FINALS: THURSDAY NIGHT FOOTBALL adjusted to 4.5, down 0.1 from last week. Elsewhere, GOTHAM and SUPERNATURAL gained 0.1 in finals, while ARROW lost the same. CABLE HIGHLIGHTS: Every show in Thursday’s cable Top 10 was sports related. NFL Network’s share of THURSDAY NIGHT FOOTBALL eked out the victory at 1.40, up 0.02 from last week. TBS’s final NLCS baseball playoffs game was right behind at 1.36. TNT’s NBA doubleheader was at 1.09/1.06. The top non-sports telecast was Lifetime’s PROJECT RUNWAY, down 0.03 to 0.47, while AMERICAN BEAUTY ROSE ticked up to 0.12. AMC’s BEHIND THE DEAD promo special for Sunday’s WALKING DEAD season premiere was at 0.37. MSNBC’s RACHEL MADDOW SHOW led cable news at 0.34/0.49/2.6M, with Fox News’s HANNITY at 0.33/0.53/3.2M, and CNN’s ANDERSON COOPER 360 at 0.20/0.27/1M . 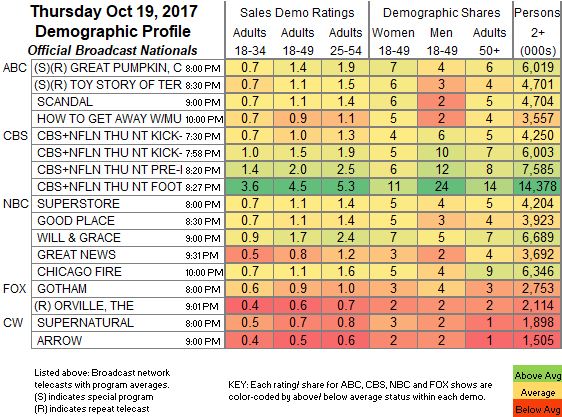 On HGTV, HOUSE HUNTERS rose 0.07 to 0.31, HOUSE HUNTERS INTL gained 0.06 to 0.30, and FLIP OR FLOP was at 0.29/0.24, compared to last week’s 0.22. On ID, HOME ALONE was steady at 0.29, and BLOOD RELATIVES ticked down to 0.22. Bravo’s FLIPPING OUT fell 0.06 to 0.27. 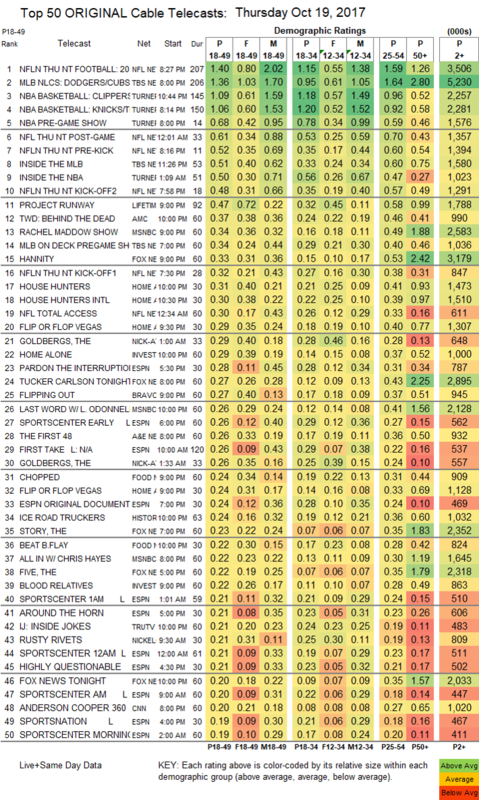 On A&E, THE FIRST 48 returned at 0.26. Food Network’s CHOPPED was at 0.26, and BEAT BOBBY FLAY was down 0.02 to 0.22. History’s ICE ROAD TRUCKERS climbed 0.06 to 0.24. Tru’s INSIDE JOKES was at 0.21. FX’s newly-renewed BETTER THINGS slipped 0.02 to 0.16. We’s MARY MARY dropped 0.03 to 0.13. On Syfy, VAN HELSING was steady at 0.13, and GHOST WARS ticked up to 0.11. Comedy Central’s NATHAN FOR YOU fell 0.02 to 0.12, and THE PRESIDENT SHOW relocated to primetime with a very late-night 0.08. CMT’s DALLAS COWBOY CHEERLEADERS dropped 0.02 to 0.08. POP’s IMPACT WRESTLING was steady at 0.07.